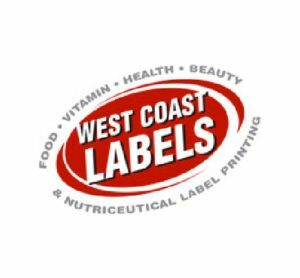 We are your premier packaging goto in Corona, CA. We are your everything guy, we can wear all the hats. 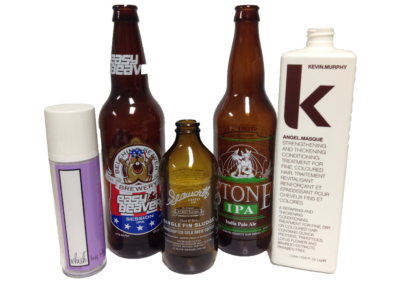 We can produce your shrink sleeves for you or we can decorate your bottles. 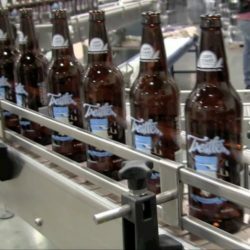 Have a production problem? We can strip and re-label your product. We have automatic coders and manuals coders, we can do 1oz bottles to 1 Liter bottles. 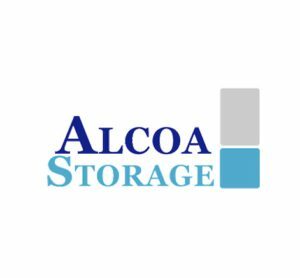 We strive to guarantee the best quality packaging possible on your plastic, glass or aluminum containers. We have produced billions of shrink sleeves, decorated millions of bottles and have re-sleeved bottles like crazy. 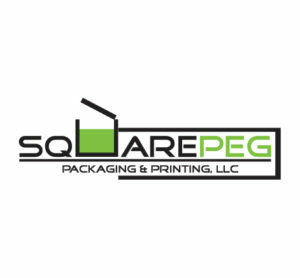 We are excited to serve all your packaging needs. If you are shopping for a label supplier, you can halt the search with confidence. Zion is the best. You will not find better quality, more personal service, and consistent reliability anywhere else. Despite tight production schedules, Zion packaging has always been able to meet or exceed our requirements. 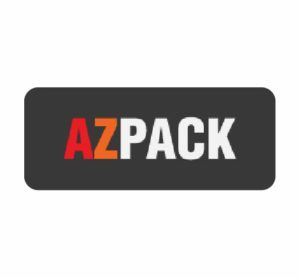 Zion Packaging is a critically valued partner for us that provides great quality and service. Zion Packaging for many years has supplied us our sleeves and other needs. They are a company of excellence and deliver their services in a very timely and professional manner. We greatly appreciate them. Craig Keeland - CEO of Forbes Pharmaceuticals, U.S.
Zion is truly supportive. A great team, producing amazing quality. We knew right away that this would be a long term successful partnership. Zion is a part of our Juiceology family. 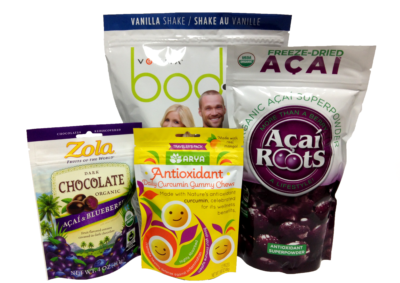 Zion Packaging provides quality shrink sleeves for our products. They have provided unparalleled support and service over yeas. Truly a fantastic vendor to work with. Zion’s quality is not only in their product but in their services as well. Re-packaging our product configuration was a snap with them. Zion has been a valuable strategic partner from the design process all the way through to the finished product. Its quality, timely and cost effective services are second to none. Ken Wong - AgroLabs, Inc.
Zion Packaging has customer service, quality and products that are superior to any other company in the industry. Your product’s packaging is your Mona Lisa, your Persistence of Memory, your product’s own masterpiece. And when presented to the world, you want your product to have the best printing and production. May the world know that your product stands on the top; above all others. Shrink Sleeves are our bread and butter. We have been helping customers meet their design expectations since 2010. Whether you’re a fledgling startup or a multinational brand we have been through the ropes with all types of companies and understand the particular needs of each type. We are ready to engage you with our full facilities, so that we can bring your highest quality shrink sleeves. 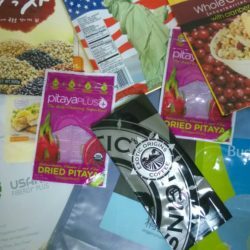 Pouches were our second endeavor. And building off our experience with shrink sleeves made mastering this a snap. Whether you need help with a stand-up pouch, a pillow bag or a sachet we can help you. 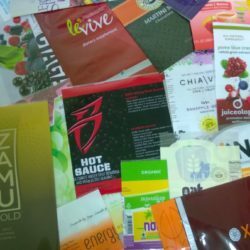 Utilizing are same high quality printing practices we can print beautiful pouches and convert them with any number of materials to meet your products storage requirements. At the end of 2013, we invested heavily in large scale screen printing. We had to jump some hurdles and grow both physically and spiritually but we are determined. And after all our hard work, we are one of the premier glass and plastic screen printers in Southern California. 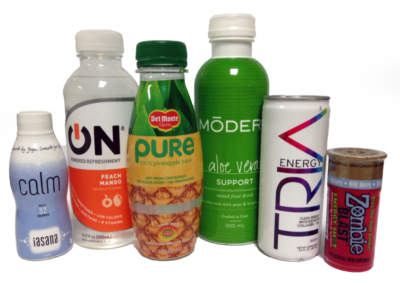 Our machines are top of the line, completely servo driven, organic printed, UV cured and able to print on almost any container. Since we opened we have printed over a billion sleeves. Since we started doing repackaging we have labeled over a million bottles. Now we are combining these 2 services to provide our customers with customer labeled cans. 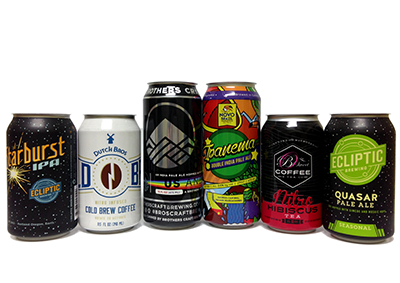 These shrink sleeve labeled cans are a quick and low upfront cost alternative to printed cans. With small minimums and quick turn around times you can get your product filled and to market ahead of your competition. Something has gone terribly wrong and you need it fixed. It happens to the best of us; incorrect barcode, wrong nutrition facts. etc. We have the experience and the staff to fix these problems. Sometimes the best solution is to remove your current packaging and apply completely new packaging to it. In the unfortunate case that this happens to you, we are here to help and can quickly mobilize the people needed to get this done. We have boiler and a steam tunnel on our premises. The two things needed to apply new shrink sleeves to you product so that they look perfect. Whether it is going back into the old box or changing into a new box, we have done it. We have automatic box tapers, hot glue guns and bundle wrapping available. We have had and fulfilled many strange requests and are happy to do what needs to be done for you as well. We can help whether it be dog bones, rainbow packing, inserts, or anything else. We have our own refrigerated box truck that we use locally to meet our customer’s products needs. 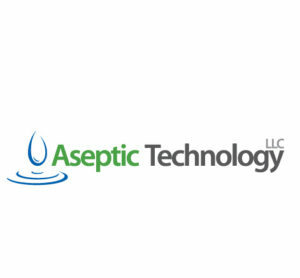 Outside of southern California we have partnered with several shipping companies to match our customers requirements. We here at Zion believe in ‘ownership’ which means that your business is our business. When your business succeeds, we succeed as well. We look forward to adding you to our long list of customers.